These new aluminium cutting rules from SHINWA protect the hand that is not holding the knife. The guard strip can be folded up so that a 35 mm high barrier is created between the material being cut and the upper edge. The hand holding the rule is well protected even if the knife happens to slip. The cutting rule is easy to transport and store with the guard strip folded down. The ends are protected by polyacetate caps. The cutting edge has an inset made of rustproof steel to protect the aluminium body from being nicked by the cutter blade. Two wide rubber strips on the underside effectively stop the rule from slipping. 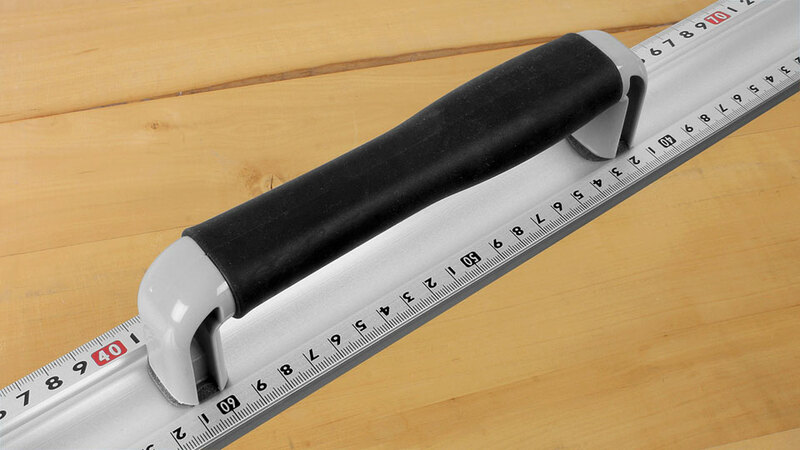 The opposite edge features a metric scale and serves as a ruler. Set back from the metric scale you will see a shaku scale, a traditional Japanese measure of length. 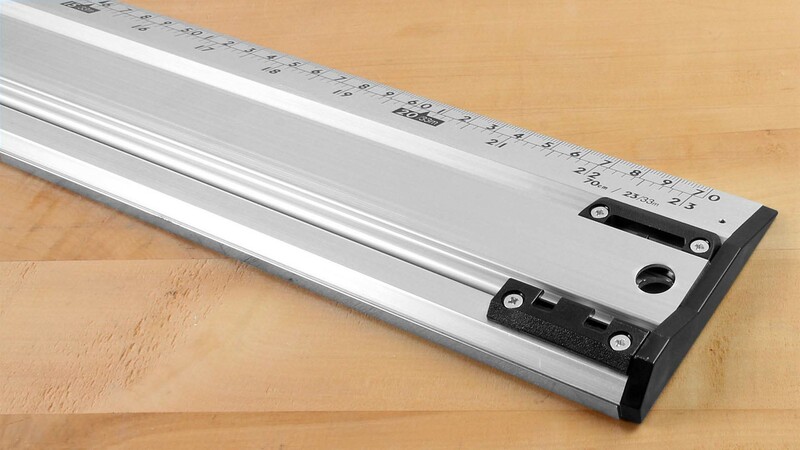 Although it is no longer officially recognised in Japan, the measuring instrument manufacturers keep the link to the past by adding the shaku scale. Moreover, this is what is expected by tradition-minded Japanese users. We in the western world need not concern ourselves with it, especially as this measure has been relegated to the second row. This note is simply to inform you what the unusual measure of length engraved on your rule is all about. 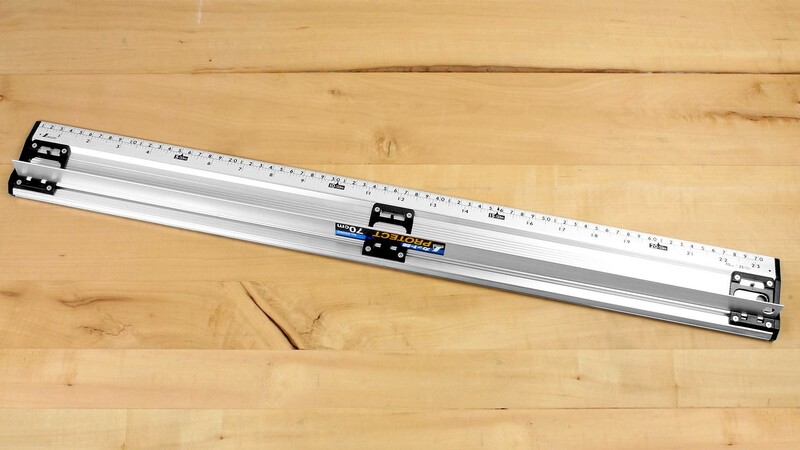 SHINWA Cutting Rule - without Handle These cutting rules are lightweight, sturdy and precise. They are made of aluminium with stainless steel inserts along both edges to protect the aluminium from the cutting tool. Two rubber strips on the bottom prevent the rules from slipping. The lightweight material ensures hours of comfortable, fatigue-free use. 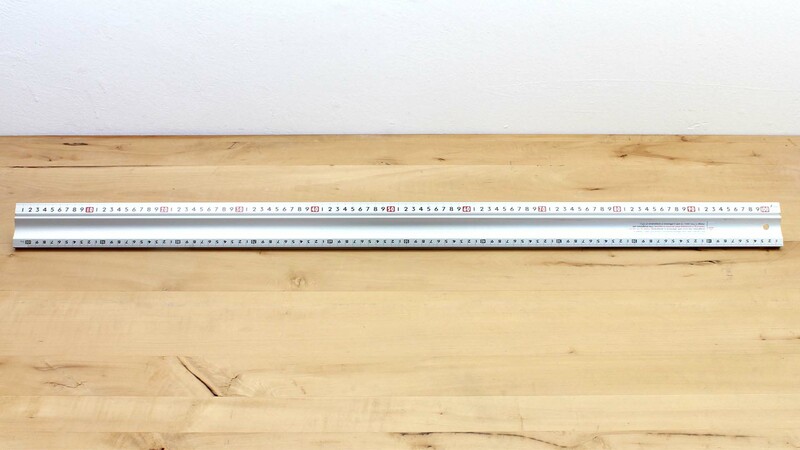 The ruler is coated black with a white scale for good readability. 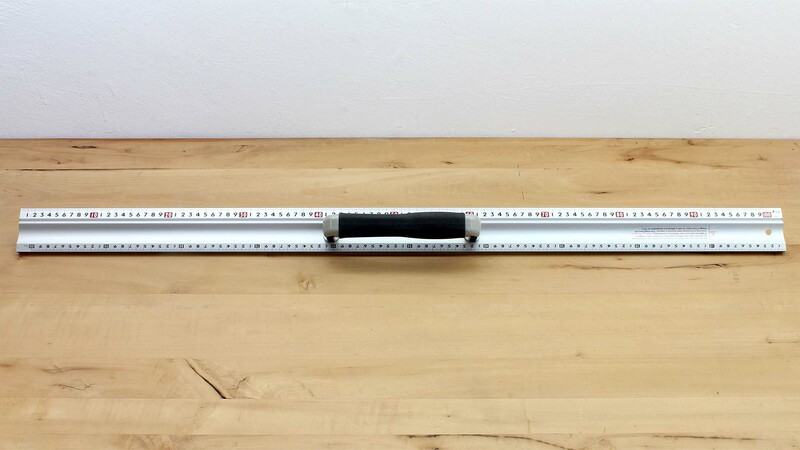 The rulers feature a metric scale as well as a shaku (303 mm or 10/33 m) scale as they were made for the Japanese market. 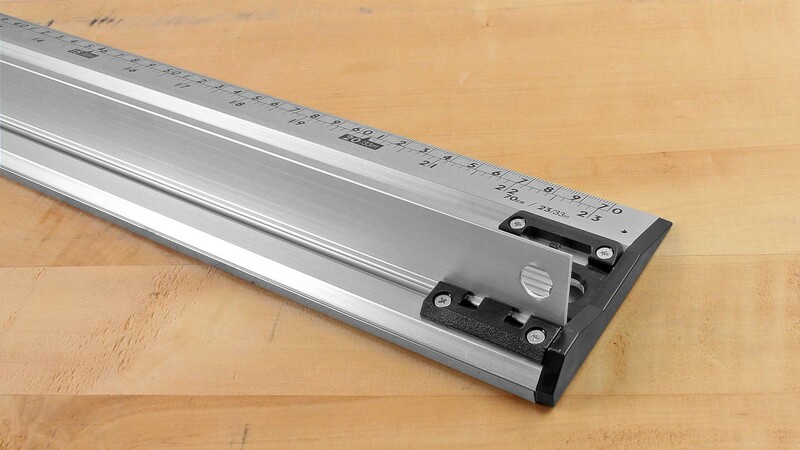 The shaku scale is used on the high edge, the metric scale on the bevelled edge. Made in Japan by Shinwa. 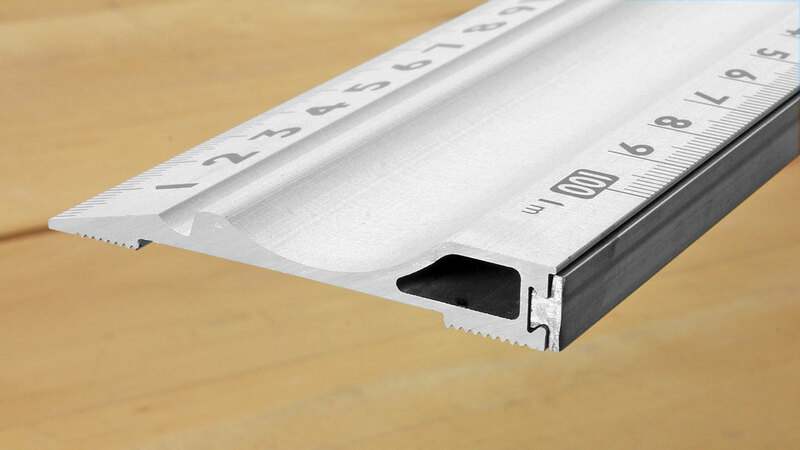 SHINWA Aluminium Cutting Rule with Steel Edge These cutting rules of aluminium with metric scales are available in lengths of 1 and 2 metres. This allows you to cut even longer items in one go. The cutting edge made of rustproof steel is recessed securely into a dovetail groove. Rubber pads on the underside effectively stop the rule from slipping. The scale’s bold numbers ensure very good readability. 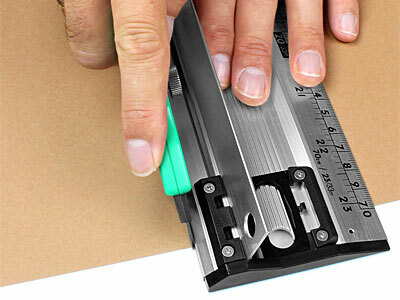 Naturally you can use this cutting rule also just for measuring. Note: Avoid all contact with solvents! There is a risk of the scale colours smudging! Aluminium can expand or contract in response to temperature fluctuations. For instance, a temperature difference of 10 °C can result in a change of length of up to 0.24 mm/m. Allow for this in your accuracy considerations! SHINWA Aluminium Cutting Rule with Steel Edge and Handle Design as above, but with a top-mounted handle. The ergonomic handle is made of ABS and covered with soft elastomer. This ensures that it will never feel cold or unpleasant to touch regardless of the ambient temperature, the time of year or whether you work in unheated rooms or outdoors. The cross-sectional height includes the height of the handle.